There’s nothing more relaxing than an invigorating, morning drench. But how can you enjoy such a simple pleasure with your outdated bathtub? A walk-in shower could be exact the solution. What exactly is a walk-in shower? In a nutshell, it’s a water-proofed showering area that has no hinged doors, allowing you to simply “walk in.” One popular design feature with a walk-in shower is to build a wet-room-style floor where the floor is tiled throughout, and a preformed shower mat is placed beneath the tiles. Another common feature is a frameless and fixed-glass screen that shields water spray from the rest of the bathroom. And depending on the size of the space and what works with the rest of the fixtures, some walk-ins can even be totally open. Space Savers. Whether you want more space in your bathroom or you really just want to create the illusion of it, a walk-in can help with both. Removing the need for a bulky cubicle-space translates into valuable space traditionally taken up by shower doors or high trays. This is especially helpful in rooms that are narrow or have low ceilings. When it comes to planning your layout, a walk-in shower with a wet-room-style floor also offers more flexibility, especially as there is no fixed tray size and it can be fitted into tricky spaces. 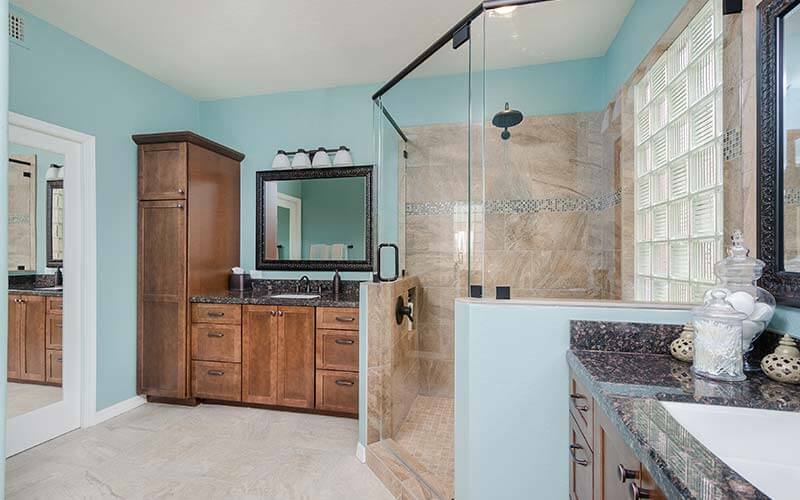 Here are five reasons why you should choose a walk-in shower for your next bathroom project. There are a number of practical benefits. A huge advantage that a walk-in shower has is that it’s much easier to use. Thanks to a door-less and step-free design, walk-in showers are ideal for those individuals with less mobility. And with extra space for showering, two or more children can be washed simultaneously, easing the morning or bedtime routine. Double showers can also be fitted inside the wet area for dual showering, which adds a luxury touch. Keep in mind: if you opt for a shower tray, go for a slim-line design that can be fitted flush with the floor, so there is a minimal step reduces trip hazard. They’re easy to maintain. Minimal hardware equals minimal cleaning. With no handles or hinges to clean, it’s really the way to go. Most glass panels come with easy-to-clean tempered glass, which makes it incredibly easy to spray down, while the tiled floor inside the shower area can be cleaned with the rest of the floor as part of your normal mopping routine. You get a high-end look that also adds value. The sleek lines and minimal style of walk-ins gives them a luxurious look that can boost any bathroom’s look. Typically, buyers consider the bathroom and kitchen to be game-changers when it comes to purchasing a house. The durability stands the test of time. With fewer fittings involved when compared to standard enclosures, walk-in showers will stand up to years of usage and plenty of wear and tear. No more replacing hinges or worn-out door seals. Have a question? Ready to take the next step? Schedule your free, no-obligation modern bathroom remodel in Scottsdale consultation with one of our bathroom remodeling contractors today.